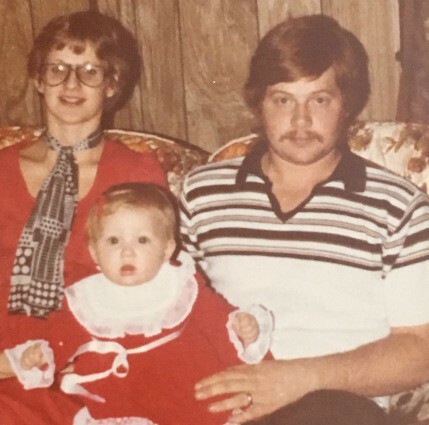 That’s my folks & me — Christmas 1979. That was my Mom’s first Christmas as a mother. That stupid look on my face is me in awe of everything she did to prepare for the holiday. She dressed everyone in this picture. She picked out all our presents. (I’m sure she went overboard.) She decorated the entire house inside & out. She baked cookies for neighbors and friends. She helped her mom and her mother-in-law without them asking. She did it all that holiday…and has done the same for 39 years of holidays since, and every other day for that matter. My Mom was born to be a mother. She basically raised her younger brother, my Dad, and her own four kids. 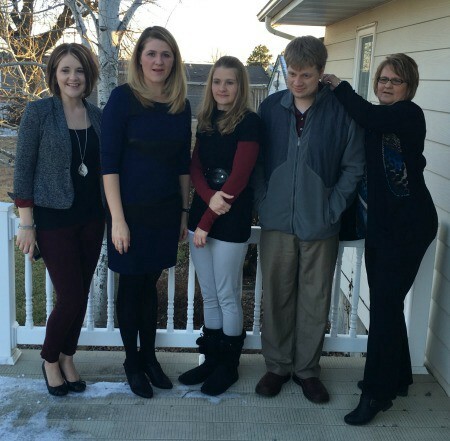 This is my siblings & me — Christmas 2015. My mom is the most generous, thoughtful person I’ve ever met. It’s no wonder she has back pain — she’s been carrying babies and everyone else’s troubles since she was 10! 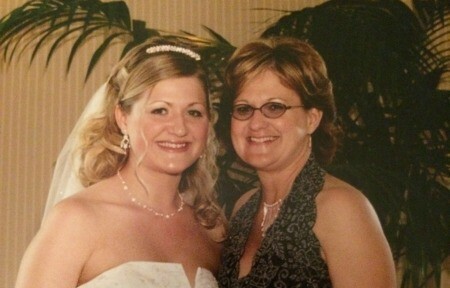 My mom is also the strongest woman I know. Even when the back pain slowed her down physically, it never touched her mentally. She had her second back surgery a few years ago, and this time the recovery has been hindered by nerve damage to her legs. All of the sudden the woman who carried the weight of our entire family and a good portion of her community, can’t physically stand to carry her own. I live across the country from her now, but would drop everything if she asked for help. My sisters live closer, and thankfully, are there to help. But Mom doesn’t ask. She knows we are busy, and doesn’t want to be a bother. Meanwhile across town, my Grandma struggles to get around in her walking cast. She broke her ankle doing something her two sons would have been more than happy to help her with. Now, she is hobbling around doing more of those tasks because she doesn’t want to be a nuisance. And closer to me, a dear friend recently moved herself and her daughter into an adorable new home — one carload and box at a time. While the friends of both mother & daughter sat nearby…in their homes, totally ready, willing and able to help … if they had only received the call to help. Women everywhere — all ages, stages, races, and wages — are failing to ask for help. We are smart enough to know we need help. We are vocal enough to speak our minds. We are kind enough to offer a helping hand to both friends and strangers. But yet, we struggle to put the three qualities together, and ask for help when we need it. We don’t ask for help because we weren’t taught to ask for help. The Independent Woman — It’s how we were raised. We were taught to be strong. But with that mindset, we have also raised daughters who would rather struggle through it than ask for help. The Ambitious Woman — It’s our culture. What you have is nice, but what she has is better. Keep pushing. Take on more. More roles, titles, responsibilities. Only you control your own destiny. The Nurturing Woman — It’s in our DNA. We care for others. We help others. Selflessly, loyally, without question or expectation. Give, give, give. Asking for nothing in return. Mother, daughter, sister, wife, boss, friend…each role takes time, energy, and effort. Being everything to everyone — that’s who we were born to be. The Thoughtful Woman — It’s the way we are conditioned. We carry our own baggage & dreams— as well as the struggles and ambitions of everyone we love — in our heads, on our shoulders, in our hearts. We worry about dinner, homework, budgets, and others — all day, every day. To the independent woman, recognize & be mindful of your own limitations. Asking for help is not a weakness. Rather, it’s self-awareness and wisdom. To the ambitious woman, achievement & success scale when you bring others along. Asking for help is an invitation for others to join your mission. To the nurturing woman, caregiving begins with oneself. Asking for help is your biggest leap towards self-care. To the thoughtful woman, the sincerest forms of generosity are reciprocal. Asking for help welcomes those you love to do the same for you. So what happens to the woman who doesn’t ask for help? She raises a daughter who doesn’t ask for help. Just ask my mother’s daughter. She is independent, ambitious, nurturing, thoughtful. Yet still, she finds it quite hard to ask for help because that’s what her mother taught her. Stacy Cassio is the Founder / CEO of the Pink Mentor Network, the 1st female mentorship mission in Charlotte, NC. Stacy understands the importance of mentorship because her own career was built on the opportunities given to her by mentors. Stacy started the the Pink Mentor Network in February 2017 as her own personal quest to find mentorship. What Stacy learned was that extraordinary women will have coffee or make introductions, but building a mentor relationship often takes more time & energy than these women had to offer. So instead of adding to the mentors' plates, Stacy made it worth their time & energy. She brought a mic, found a stage, and invited the most eager & ambitious women to join them! That mission led Stacy to launch of Pop-Up Mentor in July 2018. Today, the network helps thousands of women who are seeking mentorship.